The updated Mercedes-AMG GLC 63 and GLC 63 Coupe debut their power and panache at the New York Auto Show. In standard form, both models pack a 4.0-litre twin-turbo V8 making 469 bhp and 479 pound-feet. There's also a more potent GLC 63 S Coupe that pushes the same powerplant to 503 bhp and 516 lb-ft, and Mercedes claims this version is the world's fastest SUV to lap the Nürburgring Nordschleife at 7:49.369 minutes. Both tunes come with a nine-speed gearbox and all-wheel drive. The standard GLC Coupe can reach 60 miles per hour in 3.8 seconds, and the S model shaves that figure down to 3.6 seconds. Opting for the more powerful version also increases the top speed to 174 mph, instead of the regular model's electronically limited 155-mph maximum velocity. An electronically controlled rear differential makes sure the power goes where it's necessary during cornering. Both variants also come standard with an air suspension and adaptive damping. On the outside, the updated GLC AMG models are noticeable from their revised grille that now gets wider along the bottom. There are also skinnier LED headlights. At the back, there are redesigned taillights with a blockier design. The S variant gains matte Iridium Silver trim, including on the rear diffuser. The models come standard with 20-inch five-spoke wheels, and buyers can upgrade to 21-inch pieces. Both models great front passengers with standard sport seats. Mercedes' familiar MBUX infotainment system stretches across the dashboard, and the tech has AMG-specific display modes like Classic, Sport, and Supersport. The S model adds Nappa leather upholstery, AMG badges on the head restraints, and red highlights on the leather instrument cluster. There are also optional AMG Performance seats with more prominent bolsters. All the models in the GLC 63 family will go on sale in late 2019. Mercedes will announce more info closer to launch. Affalterbach. Sharpened vehicle dynamics, optimum connectivity, operation via gesture control: Mercedes-AMG is updating the successful GLC 63 4MATIC+ models (fuel consumption combined: 12.4-12.1 l/100 km (22.8-23.3mpg); combined CO2emissions: 283-275 g/km)1 . 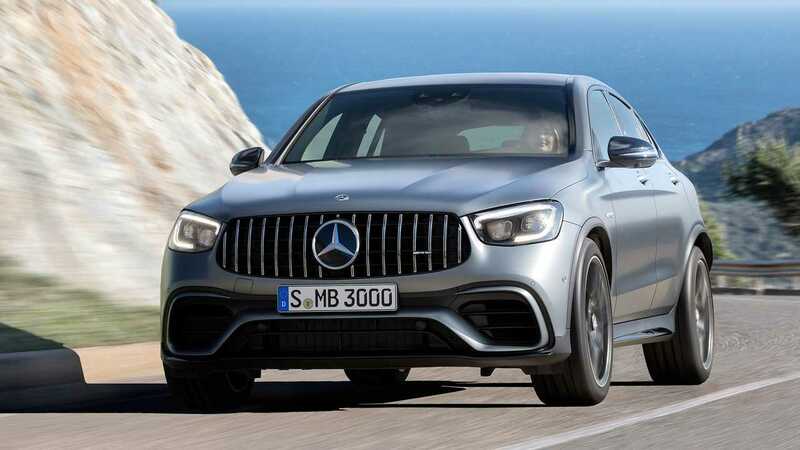 The SUV and coupé are being given a new, even more distinctive light design as well as the MBUX infotainment system with AMG-specific functions and displays. The new dynamic handling control AMG DYNAMICS and the locking differential, which is now controlled electronically on all models as standard, facilitate even more versatile driving experiences. The SUV and coupé are also the only vehicles in the competitive environment to be driven by an eight-cylinder biturbo. Maximum driving pleasure is also ensured by the air suspension with adaptive damping adjustment, the all-wheel drive with fully variable torque distribution and the high-performance compound brake system. The mid-size performance SUV also offers plenty of space for passengers and luggage, a variable interior, extensive safety features and a high level of comfort on long journeys. With an officially measured and notarised lap time of 7.49.369 minutes, the Mercedes-AMG GLC 63 S 4MATIC+ (combined fuel consumption: 12.4 l/100 km (22.8mpg); combined CO2 emissions: 283 g/km)1 is currently the fastest SUV in the world on the North Loop of the Nürburgring. 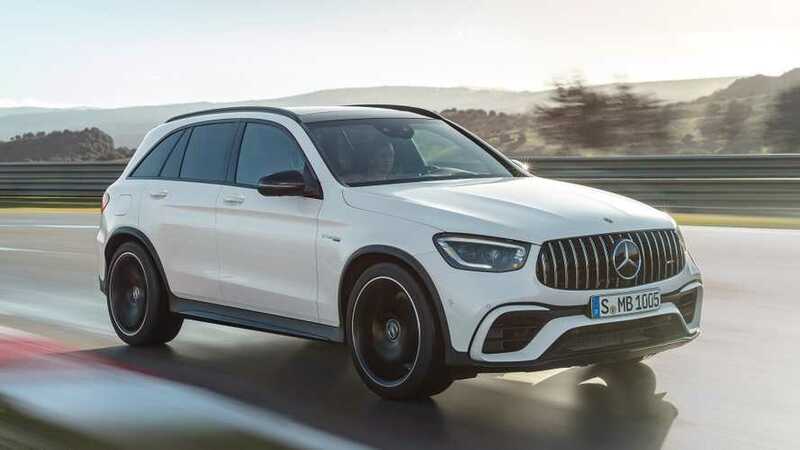 "The lap record on the North Loop has proven to impressive effect that the GLC 63 is right at the top of its segment in terms of vehicle dynamics. With our V8 biturbo, we hold a decisive USP in the competitive environment. With AMG DYNAMICS we were able to hone the vehicle dynamics even more and also further increase the suitability for everyday use and the connectivity with MBUX. This makes the GLC 63 an all-rounder for every occasion", says Tobias Moers, Chairman of the Management Board of Mercedes-AMG GmbH. New AMG DYNAMIC SELECT drive program "Slippery"
The SUV and coupé are available as base and S model variants: the AMG 4.0-litre V8 biturbo engine generates 350 kW (476 hp) or 375 kW (510 hp) with a maximum torque of 650 or 700 Nm. Acceleration from zero to 100 km/h is completed by the GLC 63 4MATIC+ in 4.0 seconds, the S models in 3.8 seconds. The top speed of the base model is 250 km/h (155mpg), 280 km/h (175mph) for the S models. The impressive driving dynamics are based, among other things, on the AMG RIDE CONTROL+ air suspension with adaptive damping adjustment, the electronically controlled differential lock, which is now also standard on all variants, and the dynamic engine mounts, which are part of the standard equipment on the S models. On the exterior design the expressive front section with the AMG-specific radiator grille widening out towards the bottom and the vertical black louvres immediately catch the eye. The restyled flatter LED High Performance headlamps reinforce the visual presence with the flare look for the daytime running lamps. The wide front apron in a jet-wing design, combined with the large front splitter, emphasises the power of the new models. By dispensing with a fine-meshed grille, it gives a view of the cooling technology – a typical attribute from the world of motor sport and a further differentiation from the other GLC models. Wider wheel arch claddings at the front and rear likewise accentuate the dynamic appearance. The side sill panels make the SUV and coupé appear to sit lower on the road while elongating the overall lines. The muscular tail end is dominated by the wide rear apron and the diffuser. The redesigned LED tail lamps also ensure an inimitable light signature – with distinctive blocks in a backlit edge-light design. Two trapezoidal twin tailpipes in high-sheen chrome round off the exhaust system. The S-model is visually characterised by exclusive design highlights. These include the 5-twin-spoke 20-inch light-alloy wheels, longitudinal member panels with inserts in matt iridium silver and the rear apron with diffuser fins and diffuser board with a trim strip in matt iridium silver. The new MBUX infotainment system helps make the car highly suitable for everyday use. Whether it is operated with the touchpad, Touch Control buttons on the steering wheel, by voice control or gesture control: the operating system of the GLC 63 4MATIC+ is just as versatile as it is flexible. All options are aimed at enabling the control tasks to be carried out as conveniently, quickly and appropriately to the situation as possible. With the new optional MBUX interior assistant, selected functions can be operated touchlessly and the reading light can be switched on and off. The advanced 3D camera system make operation easier for the driver and front passenger through approach detection, illumination support and rapid access to favourites. To do this it evaluates hand movements in the area between the media display and touchpad. In practice this means: as soon as the hand approaches the touchscreen or touchpad the MBUX interior assistant depicts certain control elements on the media display in enlarged form or highlights them. This applies to the menus of the homescreen, radio/media, map navigation, Active Parkin Assist and the seat adjustment. The assistant differentiates between driver and passenger interaction and recognises certain hand positions and movements. The interaction area for the MBUX interior assistant is in front of the media display up to the centre console, including the touchpad between the driver and the front passenger. And needless to say, the trailblazing voice control activated with the words "Hey Mercedes" is also on-board. Thanks to artificial intelligence, MBUX recognises and understands nearly all sentences from the fields of infotainment and vehicle operation, even if they are expressed indirectly. The driver receives visual information via the 12.3 inch instrument cluster on the left and the 10.25-inch touchscreen display on the right. with the three AMG-specific display styles of "Classic", "Sport" or "Supersport" it brings the vehicle functions directly to life. Via the specific AMG menu, the driver is able to call up a host of additional information to make the driving experience even sportier, such as Warm-up, Setup, G-Force or Engine Data. The visualisations in the central touchscreen media display equally enable further vehicle functions to be experienced even better, among other things through animated presentation of the driving assistance, vehicle and communication systems and AMG TRACK PACE. There is also the AMG TRACK PACE view in the optional head-up display with circuit graphic, bends, braking points, delta speed and absolute times. The instrument panel is trimmed in black ARTICO man-made leather with contrasting topstitching as standard. The high-grade look is underlined by aluminium trim. The touchpad is flanked by the AMG DYNAMIC SELECT switch and numerous AMG-specific controls, such as the button for the 3-stage AMG RIDE CONTROL+ suspension, 3-stage ESP® or the button for the optional AMG Performance exhaust system with flap control. The S model variant comes with an even more extensive equipment package, including an AMG steering wheel in black nappa leather/DINAMICA microfibre and AMG badges in the front head restraints. Extremely sporty design, a grippy shape with a heavily contoured rim and intuitive operation are the key attributes of the new AMG steering wheel in DINAMICA microfibre, which comes as standard. It has a flattened bottom section and is perforated in the grip area. The galvanised steering wheel gearshift paddles allow an even sportier driving style with manual gear shifting. On the S model, the steering wheel comes as standard with a rim in nappa leather/DINAMICA microfibre (optional for base model). The integrated Touch Control buttons can be used to control the functions of the instrument cluster and the infotainment system by means of horizontal and vertical swiping of the finger. The innovative steering wheel buttons are standard on the S model. The AMG drive programs are controlled and depicted on the integrated LCD display using the round controller. Using the two freely configurable display buttons further AMG functions can be operated directly within easy reach on the steering wheel. The AMG Performance seats provide optimum lateral support when adopting a dynamic driving style thanks to the special design of the seat side bolsters of the seat cushion and backrest. As an option, the seat side bolsters adjust perfectly to the body contours by means of built-in air cushions. The performance seats additionally lend the interior an even sportier character with their integral head restraints. The seat heating ensures pleasant seating comfort even at lower outside temperatures. "Slippery", "Comfort", "Sport", "Sport+", "Individual" and "RACE" (S model only). 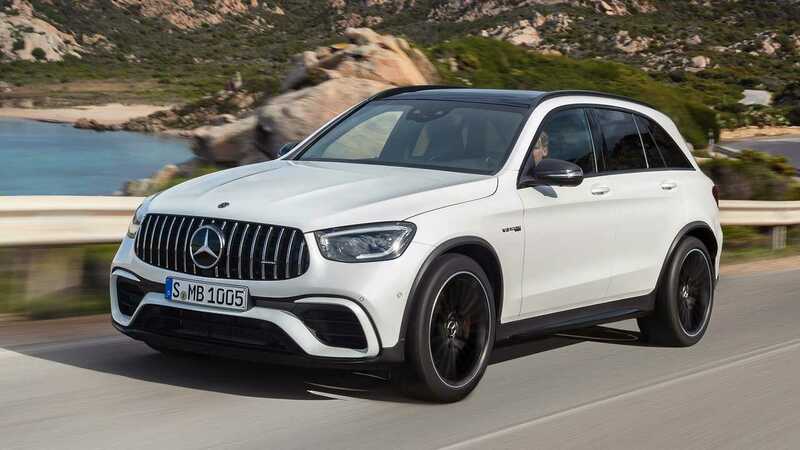 The programs are linked to the AMG DYNAMICS agility control, which means that the handling characteristics of the GLC 63 4MATIC+ can be set to meet various requirements and driving conditions with even more differentiation. Behind the umbrella term AMG DYNAMICS are the agility functions "Basic", "Advanced", "Pro" and "Master" (S model only), which are automatically selected by the respective drive program. Driving-relevant parameters such as the torque distribution of the all-wheel drive, the interventions of the electronically controlled locking differential and the control thresholds of the completely redeveloped ESP® are intelligently adjusted depending on the drive program. "Basic" is assigned to the "Slippery" and "Comfort" drive programs. In this case, the GLC 63 4MATIC+ shows very stable handling with high damping of the yaw rate. "Advanced" is activated in the "Sport" program. The GLC 63 4MATIC+ is then neutrally balanced. The lower yaw damping, lower steering angle requirement and enhanced agility support dynamic manoeuvres such as driving on winding country roads. "Master" (only in the S model) is coupled with the RACE drive program. "Master" mode is aimed at drivers who want to experience dynamism and the driving enjoyment on closed-off circuits. "Master" offers an extremely neutral vehicle balance, low steer angle requirement and more agile steering. In this way, "Master" ensures maximum agility and fully exploits the dynamic potential. Irrespective of the drive programs, as before the driver can use the buttons in the centre console to directly select manual transmission mode, their favoured suspension level and also the exhaust system, for instance. The 4.0-litre eight-cylinder biturbo engine is already used in numerous AMG performance vehicles. A characteristic feature is that the two turbochargers are positioned not on the outside of the cylinder banks, but inside the cylinder "V". The main advantages of this design are the compact engine construction and optimal response. The spray-guided direct petrol injection system ensures clean and efficient combustion with high thermodynamic efficiency. Fast-acting piezo injectors enable multiple injections of fuel to be delivered to the engine on demand and with the utmost precision. The extensive engine cooling system ensures the engine's performance even under extreme loads. The same is true for the flow-optimised cylinder heads, which are made of a special heat-resistant alloy. Continuous adjustment of the intake and exhaust camshafts improves power delivery and efficiency. It delivers excellent throttle response and optimises the charge cycle for every operating point. An oil pump with variable control also contributes to low fuel consumption. The as-standard typical V8 engine sound comes courtesy of an exhaust system with flap technology. The flaps are controlled by a map and automatically operated depending on the AMG DYNAMIC SELECT drive program, the power demanded by the driver and the engine speed. Optionally available is the Performance exhaust system, which allows the sound to be modulated at the press of a button. A wet start-off clutch replaces the torque converter on the AMG SPEEDSHIFT MCT 9G transmission. It saves weight and optimises response to accelerator pedal commands, especially when accelerating or coming off the power. The multiple downshift function allows more spontaneous bursts of speed, while the double-declutching function in the "Sport" and "Sport+" drive programs makes for an even more emotive driving experience. Defined ignition adjustments also provide faster gear shifts in the other modes. In all modes moving off occurs in first gear in order to always guarantee a dynamic driving experience. The intelligent AMG Performance 4MATIC+ all-wheel drive combines the advantages of various drive configurations in one: the fully variable torque distribution to the front and rear axles ensures optimal traction right up to the physical limit. the driver is also able to rely on high handling stability and a high level of safety under all conditions, in the dry, in the wet or in snow. The transition from rear-wheel to all-wheel drive and vice versa is seamless, because the intelligent control is integrated into the overall vehicle system architecture. An electromechanically controlled clutch connects the permanently driven rear axle fully variably to the front axle. The best possible torque split is continuously computed according to the driving conditions and driver's input. Transitions are seamless and based on a sophisticated matrix. Alongside traction and lateral dynamics, the all-wheel drive also improves the longitudinal dynamics for even more powerful acceleration. The agility, highly dynamic lateral acceleration and maximum grip of the new models are also thanks to the AMG RIDE CONTROL+ suspension with fully supporting multi-chamber air suspension and adaptive adjustable damping. which ensures exceptionally high levels of camber stability, driving dynamics and steering precision. The vehicle level can also be adapted to different driving conditions. The model-specific multi-link concept at the rear axle impresses with highly precise wheel control and increased rigidity. The AMG-specific rear axle carrier makes the wider track possible in comparison with the GLC from Mercedes-Benz, while the contact surfaces of the wheel bearings have also been moved further outwards. Other measures include AMG-specific wheel carriers, stiffer elastokinematic tuning and higher negative camber. Thanks to a sporty spring and damper set-up and the adaptive damping adjustment, the new three-chamber air suspension system combines exemplary driving dynamics with excellent road roar and tyre vibration characteristics. The stiffness of the air springs can be adjusted over a wide range by activating or deactivating individual air chambers, making for perceptibly enhanced comfort and handling. There are three degrees of spring tuning, depending on the selected drive program and current driving status. The spring rate is hardened automatically in the event of sudden load changes, fast cornering, heavy acceleration or heavy braking. This effectively reducing roll and pitch while stabilising the performance SUV and coupé. The adaptive damping adjustment is also part of the standard specification. This fully automatic, electronically controlled system adjusts the damping at each wheel to the current requirements. This improves the driving safety and the ride comfort. The damping depends on the driving style, the road surface and the selected suspension setting. The ideal operating point can be selected at all times on the basis of a broad scope of information relating to acceleration or vehicle speed, for example. Via a switch on the centre console or the freely configurable switches on the steering wheel the driver can select between three different sets of damper characteristics, namely "Comfort", "Sport" and "Sport+", and thus individually influence the driving experience — from highly comfortable to sportily taut. The GLC 63 4MATIC+ SUV and Coupé are shod as standard with 10-spoke light-alloy wheels 8.0 J x 19 (front) and 9.0 J x 19 (rear) painted in titanium grey with a high-sheen finish and with tyres of size 235/55 R 19 (front) and 255/50 R 19 (rear). The dimensions for the GLC 63 S 4MATIC+ SUV and Coupé are 265/45 R 20 (front) and 295/40 R 20 (rear) on 5-twin-spoke light-alloy wheels painted in titanium grey with a high-sheen finish in 9.5 J x 20 (front) and 10.0 J x 20 (rear). There are other, optional wheel/tyre combinations as well as forged wheels, up to sizes of 265/40 R 21 on 9.5 J x 21 on the front axle and 295/35 R 21 on 10.0 J x 21 wheels on the rear axle. For improved traction and driving dynamics, all models are equipped with an electronically controlled locking differential. This reduces the slip on the inside rear wheel when cornering, without any control intervention in the braking system. The result is that it allows the driver to accelerate out of corners earlier thanks to the improved traction. The vehicle remains more stable when braking from high speed, while the limited-slip differential also improves traction from rest. The greatest benefit of electronic control is its even more sensitive and even faster adjustment capability in changing driving situations: which pushes the critical threshold higher, making it even easier to drive at the vehicle's limits. The three-stage ESP® with "ESP ON", "ESP SPORT Handling Mode" and "ESP OFF" settings works in perfect unison with the rear-axle limited-slip differential and is optimally tuned to the outstanding dynamics. The electromechanical speed-sensitive power steering has a variable ratio. It impresses with its precise and authentic feedback and can be preselected in the two settings "Comfort" or "Sport". The steering servo assistance is reduced at high speeds, and continuously increases at lower speeds. This means that comparatively little steering force is required at low speeds, and that the best possible control over the vehicle is maintained at high speeds. Furthermore, the power steering system is dependent on the current lateral acceleration, the chosen AMG DYNAMIC SELECT drive program or the damping adjustment setting. In line with the high output values the eight-cylinder models have a large-dimensioned brake system consisting of internally-ventilated, perforated compound discs at both the front and rear axles, with 6-piston fixed callipers used at the front and single-piston floating callipers at the rear. As an option, an AMG high-performance ceramic composite brake system with bronze-coloured 6-piston fixed callipers at the front and single-piston floating brake callipers at the rear can be ordered. This leads to additional weight savings and lower unsprung masses. Further advantages are their even greater overall sturdiness and fading stability under high stress. The brake system also wins points with a high service life and immediate response – guaranteeing fast lap times. All brake systems can impress with short brake paths, sensitive responsiveness and high life expectancy, even in the case of extreme stress. Among the comfort features of the vehicle are hill start assist, priming and dry-braking in the wet. With the ignition switched off and the vehicle at a standstill, the transmission automatically selects Park position "P". Meanwhile, the electric parking brake releases automatically when pulling away. The more powerful GLC 63 4MATIC+ S comes with dynamic engine mounts. These resolve the conflicting aims of comfort and dynamic performance by reducing vibrations in the engine/transmission unit. These dynamic mounts are instantly and variably able to adapt their rigidity to the driving conditions and style of driving. Soft engine mounts improve comfort, as they provide more effective decoupling of noise and vibration. However, handling and agility benefit from a generally stiffer mount set-up. The driver feels more connected to the vehicle when driving dynamically, as there is more feedback and the steering response is more direct. All in all, the driver benefits from a more precise driving sensation. The optional ENERGIZING package networks different comfort systems in the vehicle and uses lighting and music moods to increase driver fitness safety and wellbeing. The "Refresh" programme brings fresh impetus on board – an intense air flow generates an invigorating climate. "Vitality" delivers new energy – for example by including lively music. "Training" switches from passive to an active approach: with exercise videos, breaks in driving can be used to relax the muscles. A new feature is the ENERGIZING COACH which recommends programs situatively. * Figures for fuel consumption and for CO2 emissions are provisional and were determined by the Technical Service for the certification process in accordance with the WLTP test method and correlated into NEDC figures. EC type approval and conformity certification with official figures are not yet available. There may be differences between the stated figures and the official figures.